Plan de la Ville et des Forts de St. Yago - Van Schley c.
Plan of the Forts and Town of St. Yago in the Cap Verde Islands. Condition - Good, given age. 1750 Overall size - 20.1 x 27 cm Image size - 14.7 x21.3 cm. 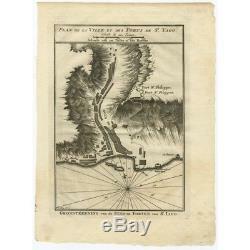 The item "Antique Map of St.
Yago by Van Schley (c. 1750)" is in sale since Sunday, January 21, 2018.